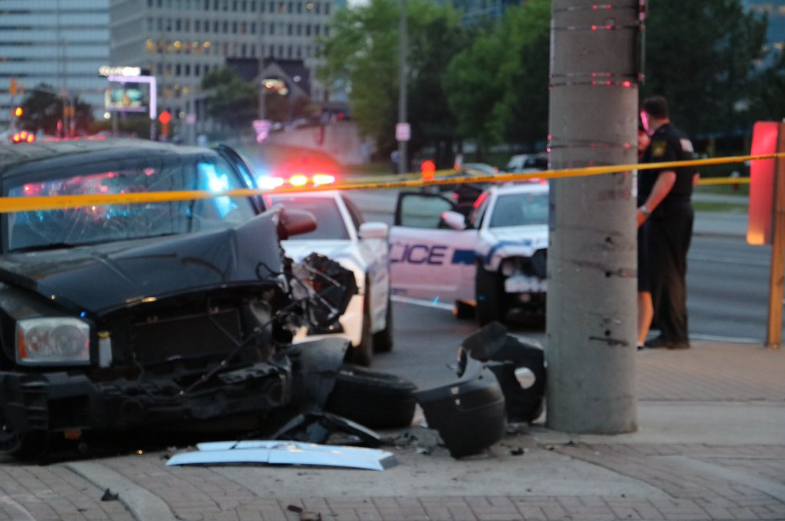 A Mississauga man is facing impaired driving charges following a police pursuit near Square One Wednesday. A pair of Peel Police cruisers were damaged while pursuing a black pickup truck driving “erratically” at 8:30 p.m. near Burnhamthorpe Rd. and Hurontario St. The driver failed to stop for police, said Const. George Tudos, adding the vehicle eventually struck a light standard. Paramedics treated the male driver and occupant for minor injuries before taking them to hospital as a precaution. The province’s Special Investigations Unit isn’t getting involved since their injuries aren’t serious. Daniel Rahimi, 23, is charged with operating while impaired by alcohol, flight from police, escape lawful custody, and excess blood alcohol.